The use of simulation in statistics dates from the start of the 20th century, coinciding with the beginnings of radio broadcasting and the invention of television. Just as radio and television are now commonplace in our everyday lives, simulation methods are now widely used throughout the many branches of statistics, as can be readily appreciated from reading Chapters 1 and 9. The book has grown out of a fifteen-hour lecture course given to third-year mathematics undergraduates at the University of Kent, and it could be used either as an undergraduate or a postgraduate text. Simulation may either be taught as an operational research tool in its own right, or as a mathematical method which cements together different parts of statistics and which may be used in a variety of lecture courses. 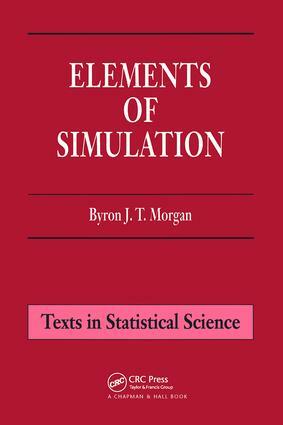 In the last three chapters indications are made of the varied uses of simulation throughout statistics. Alternatively, simulation may be used to motivate subjects such as the teaching of distribution theory and the manipulation of random variables, and Chapters 4 and 5 especially will hopefully be useful in this respect.